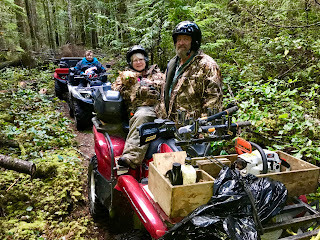 We went on a fall quad ride to explore the region you can access from the Duck Lake Forest Service Road, also called Duck Lake Main. We invited our good friends Dave and Marg to join us. First, we enjoy riding with them. 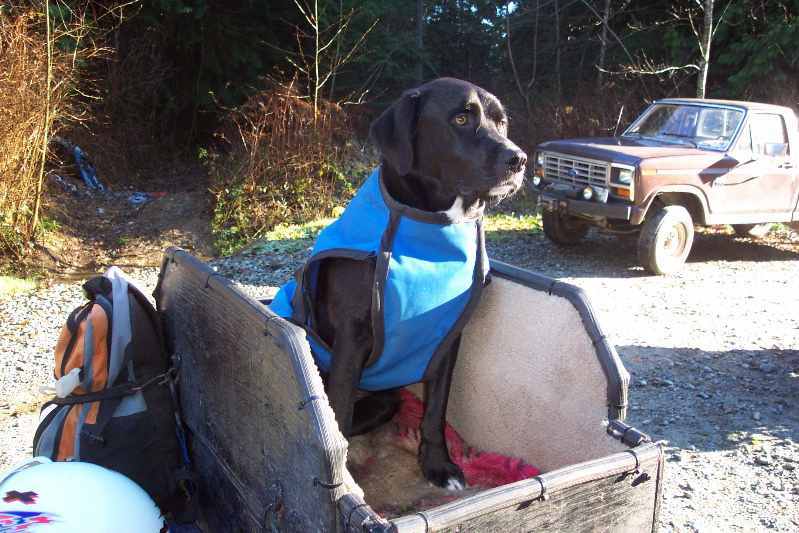 Second, Dave knows the trails around Powell River much better than we do. We went on a Sunday when loggers know to look out for the public on our backroads. 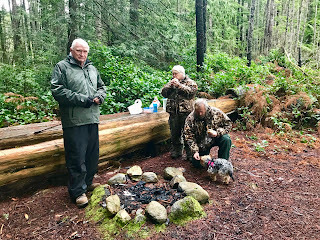 We drove south of town to the junction of Highway 101 and Duck Lake Forest Service Road, a well maintained Powell River backcountry mainline. Parking out of the way on a side sput. A short ways up the dirt road are lots of spots to park, even larger ones for trucks pulling quad trailers. 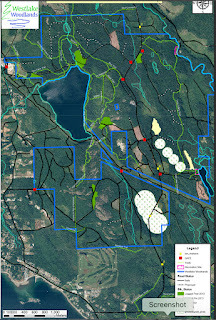 The area in which we rode is part of the Westlake Woodlands, a woodlot owned and managed by locals Doug and Ron Fuller. They offer a free online map that can be used with the Avenza GPS map app to track your route. Unfortunately, we didn't take ours since Dave was leading. Dave, Marg and their dog Crystal. It would have been a great reference for future rides. 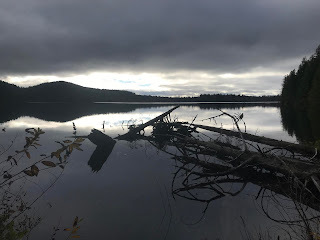 While I can't share the exact route, we left Duck Lake Main to follow several old logging roads through the lush second growth forest. Dave led the way point out side trails leading to points of interest like the golf course, Rona hardware on Paradise Road, and the trail down to the quad parking area near Edgehill School. Many old logging roads and trails are maintained by local ATV, biking, horseback riding and hiking organizations. The Blue Train Connector back to Duck Lake Main. Being close to town, they are well used and enjoyed by many. Yet, on our ride we didn't see any other quad riders and only one hiking group and a man walking his dog. We stopped at East Lake for a picnic. There are log benches, a fire ring and a dock that would enjoyable especially in summer. We continued through the area with a stop at West (Hammil) Lake. The weather was already changing from mostly sunny to mostly cloudy. Clouds hovering over West Lake. We'll go back on our own to explore the Duck Lake area while our quads are stored in town. A rare picture of us together thanks to Dave. Last summer we put our quads on a trailer and took them on vacation with us to Vancouver Island. Our destination was Stella Lake near Campbell River. Here's the article that was just published in the Spring 2018 Riderswest Magazine and on their website. Take your quads on vacation. 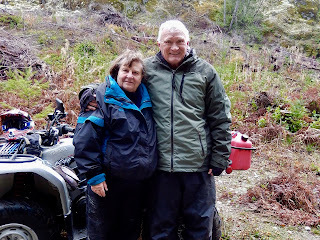 My husband and I have ridden ATVs in our home region of Powell River, B.C., for 15 years. In 2017, we explored the Campbell River region on Vancouver Island. Old logging road to Bear River. 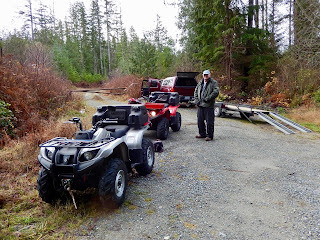 I follow the Campbell River ATV Club (CRATV) on Facebook and the CRATV Forum and know they are active in trail maintenance. 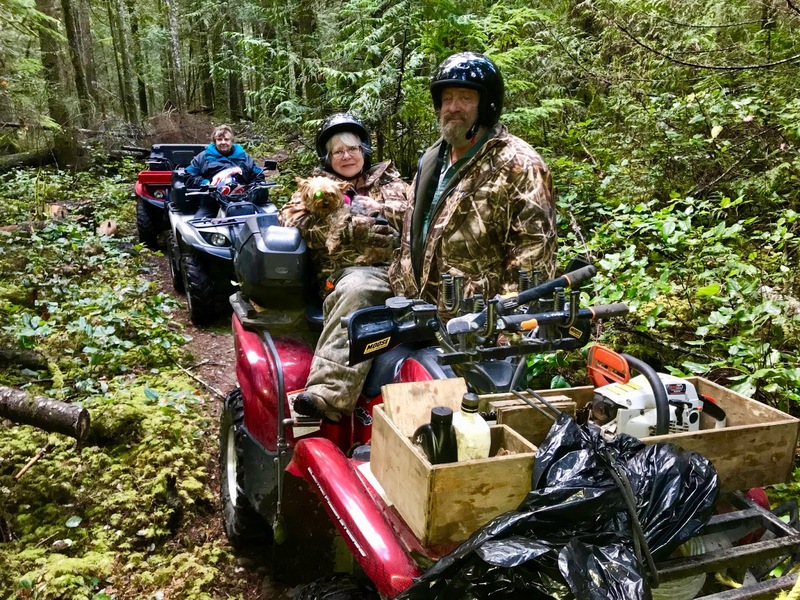 They’re also instrumental in developing long-distance ATV routes (Riderswest article) and have secured riding permission in some towns to access fuel, restaurants and overnight accommodations. 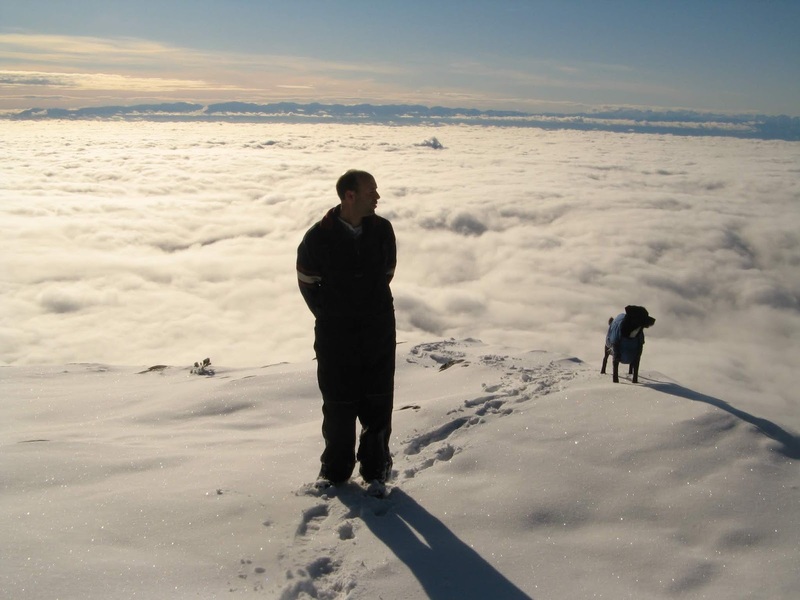 CRATV uses the Pye Mountain Recreation Site, which they built as a base for club activities. It can be accessed via Highway 19 north of Campbell River and the Elk Bay Forest Service Road (FSR). 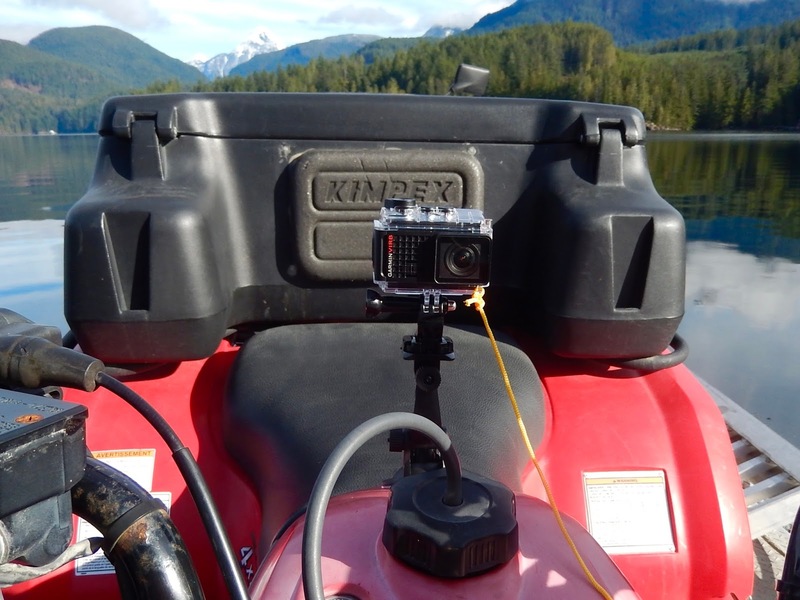 We wanted to camp near water, so we selected Stella Lake based on a recommendation from friends in the Powell River ATV Club. There are two ways to get there, either by Elk Bay or Rock Bay forest service roads. 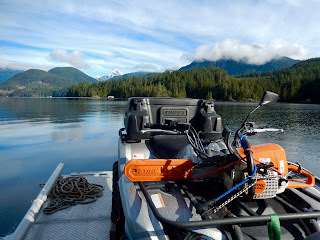 We chose the Rock Bay to Stella Lake FSR because, with our double quad trailer, we wanted to avoid the steep hill and tight turn on the Elk Bay route. On the way we stopped at the Roberts Lake Resort café for one of their famous cinnamon rolls. Blue sky and water at Stella Lake from Elk Bay FSR. We travelled in June on a Thursday. Stella Beach’s campsites were mostly open and we chose one with lake access. We offloaded our quads at the entrance, then parked the trailer in the ample site. There are pit toilets, picnic tables and fire rings, but campers should bring drinking water. Even in June, the campground filled over the weekend, but there are other camping spots in the area. Excellent signage including experience level. From our campsite, we rode forest service roads and trails developed by the Campbell River ATV Club. There’s excellent signage that includes experience level symbols as you enter trails. As an intermediate rider, that was very helpful. We also purchased Backroad Maps software for our Garmin GPS to make us more confident about riding in a new location. Overlooking Johnstone Strait from Rock Bay FSR. 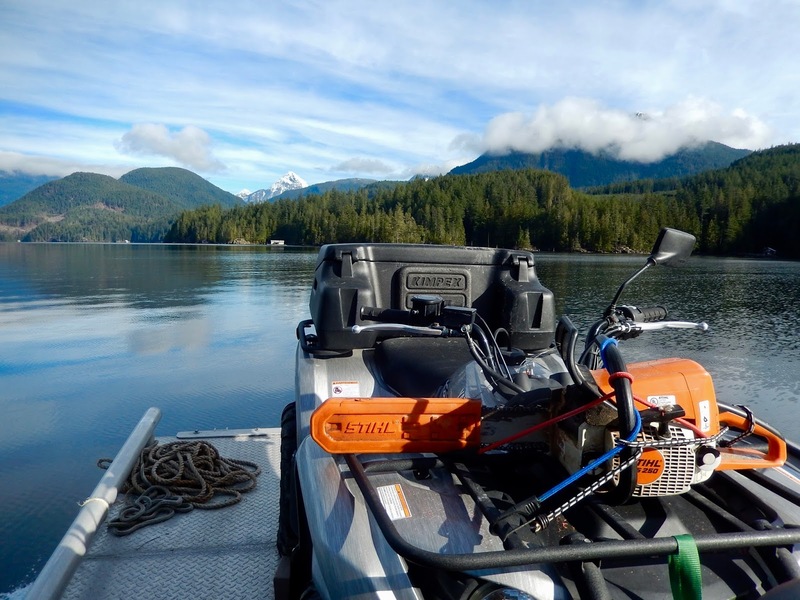 Some of the most memorable rides were to Elk Bay on Johnstone Strait, visiting the Pye Mountain Rec Site, and going to neighbouring Pye and McCreight lakes. My favourite ride was along an old logging road that branched off Bear Bight Road and wound through second growth to the Bear River (a.k.a. Amos de Cosmos Creek). Here, we enjoyed a picnic lunch in warm sunshine surrounded by a meadow of sweet gale. Sunny day for a picnic at Bear River. Where will you be going this summer? 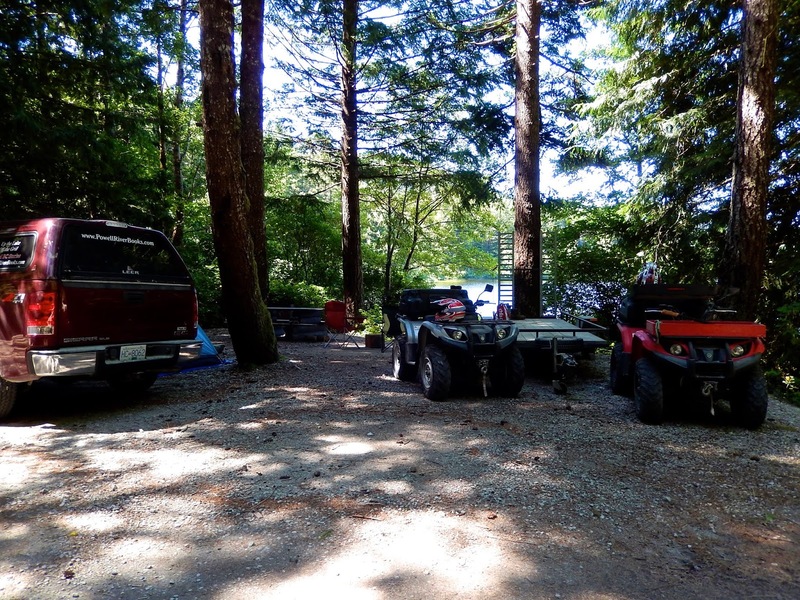 Check out the Powell River Quad Rides blog and Powell River ATV Riders’ Facebook group and bring your quad on vacation to the northern Sunshine Coast. 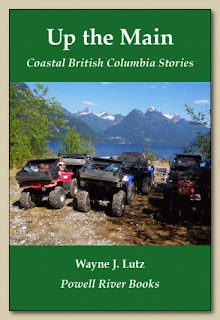 Check out Coastal BC Stories books about quad riding including Farther Up the Main by Wayne J. Lutz. Available Online: "Up the Main"
Up the Main is the book that started it all. 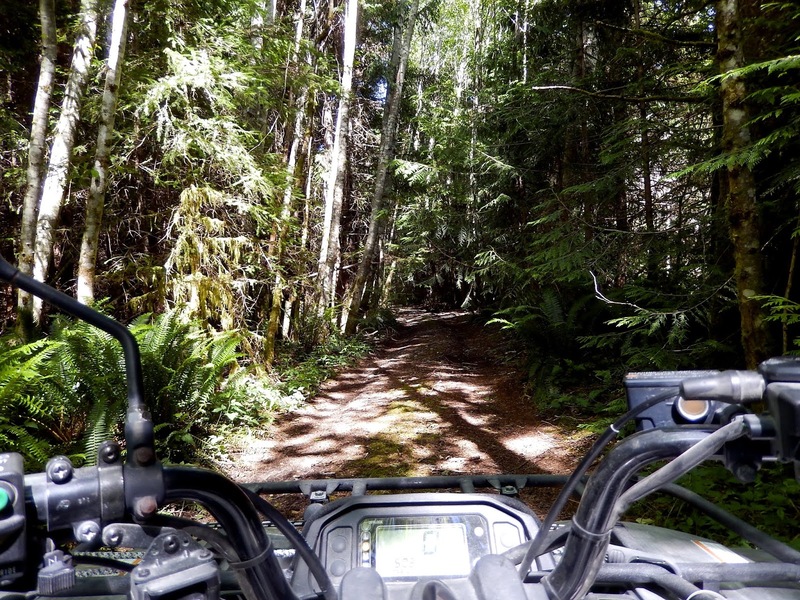 Come along as we explore Powell River's backcountry by bike, quad and hiking. 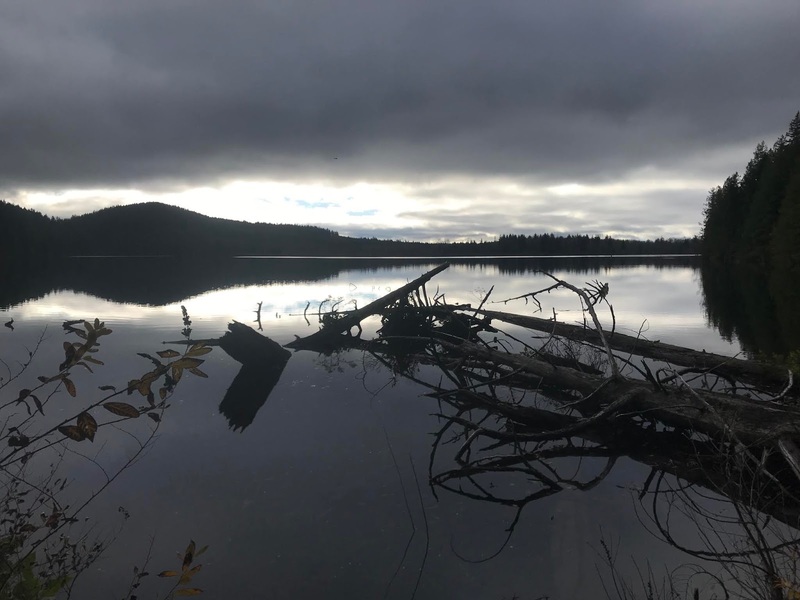 Ride with us to places like Theodosia Inlet, the head of Powell Lake, and on logging roads and local trails near and far. A great book for the outdoor enthusiast. 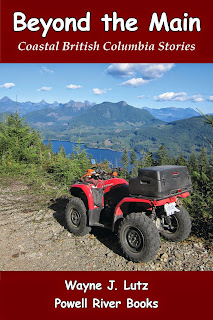 After my first book in the series Coastal British Columbia Stories, I decided to write about a subject that initially excited me very little -- exploring the local area by all-terrain vehicle. My friend John insisted I learn to ride a quad, and I followed his lead only because adventures with John are always worthwhile. I didn't think I'd become a quad addict, but it happened. 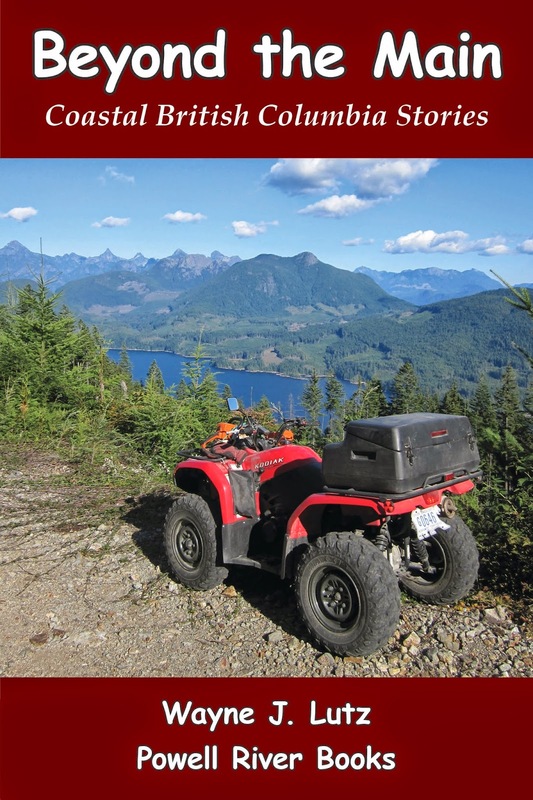 The Powell River ATV Club is a big part of my book, Up the Main, and influenced much of my future writing. Now you'll find me on the trails regularly, and writing more about off-road riding. 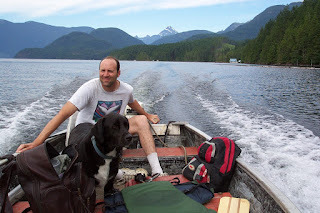 Join me (and John and his dog Bro) in exploring the Powell River backcountry. Also available at other online booksellers and Coles in Powell River. Offloading at the Chippewa Bay barge ramp. I've shared about rides up Chippewa Main here and on Powell River Quad Rides several times. That's because it's an easy place for us to access with our barge and because it gives us choices in directions to ride. On this spring ride we took our quads to the Chippewa Bay barge ramp to offload. This is our usual starting point. Because there's current logging activity, the barge ramp is well maintained. We chose a Saturday for our ride because the logging company expects more private use of their service roads, and because weekend activity is usually less. On our ride, the only work being conducted was vehicle maintenance. We stopped to talk to the crew and they said that the roads and trails were all ours. An old section of logging road heading up towards Heather Main. This trip was to see if we could get through the snow to Heather Main. This higher country logging road connects Powell Lake with Theodosia Inlet to the northwest, but we were blocked by pockets of deep slushy snow near our destination. Using the slushy snow to make a slushy drink. Take that deep snow. Come along on the ride up to Heather Main in this YouTube video. Since this ride some of our friends made it through. The warm late spring weather is quickly melting snow in the high country and reopening many of our favourite trails. Blue skies over Powell Lake on the way to Hole in the Wall. 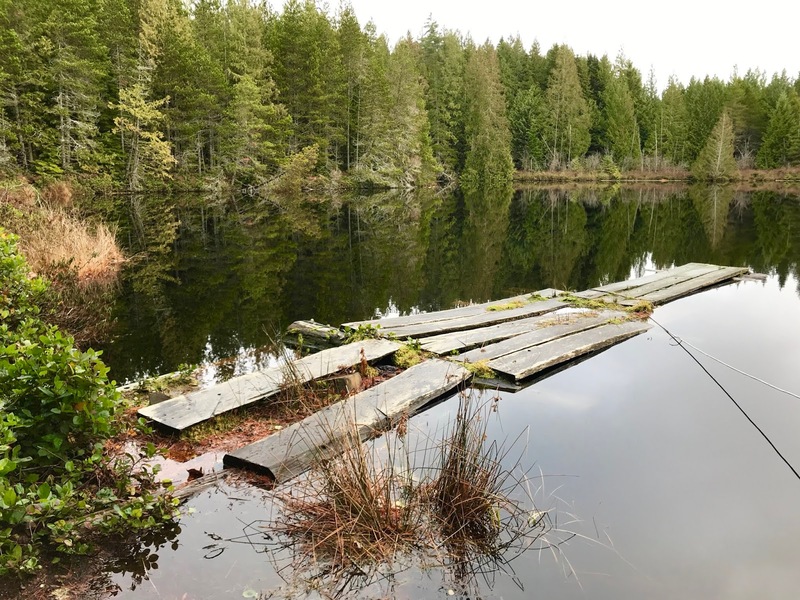 For more information about Goat Island check the Western Forest Products website or call their Road Access Hotline: 604-485-3132. It is available 24/7. 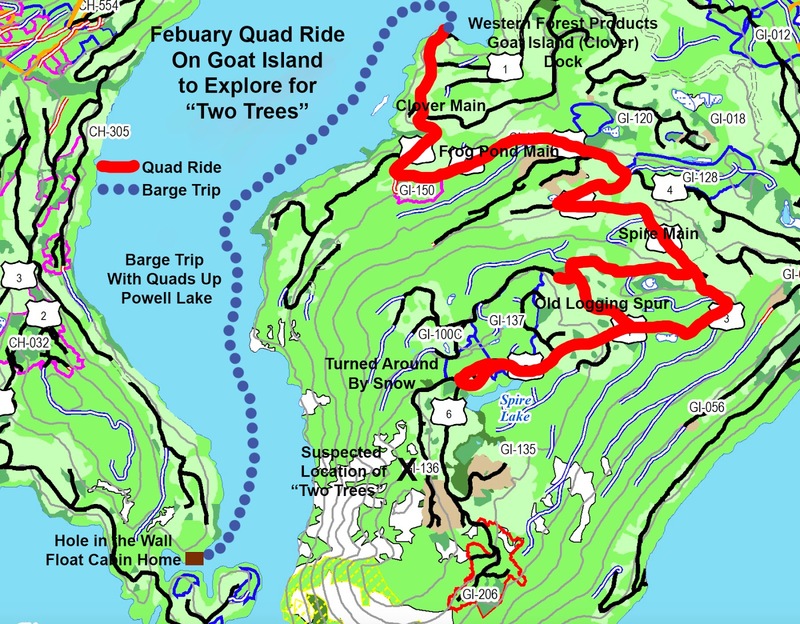 Do you have any quad trails in your area that you would like to suggest? 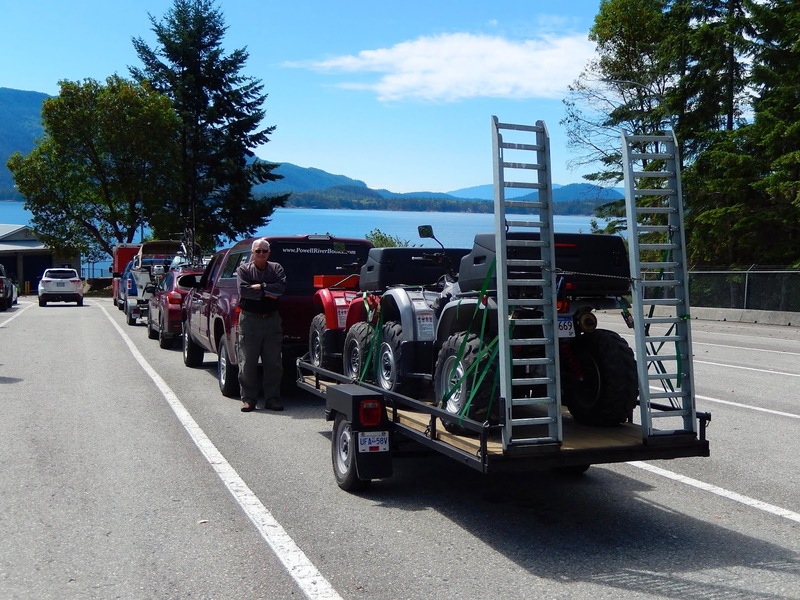 We are always looking for new places to ride and explore in British Columbia including Vancouver Island. When Wayne and I came to Powell River in 2001 our first friend was John. You can't be friends with John and not love his dog Bro, Brody if you are being formal. Bro lived a long, well traveled life. If John went anywhere, Bro was always at his side. That ended sadly this month when Bro left this earthly world to go meet his maker. When John and his family came to visit awhile. And soon enough they were wooed. to a loving home that would last forever. 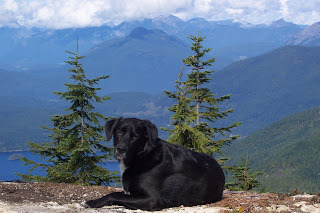 a Black Lab named Bro could ever imagine. We waited a long time for a sunny weekend to go quad riding. On the first sunny Saturday we headed for a favourite destination, Goat Island. 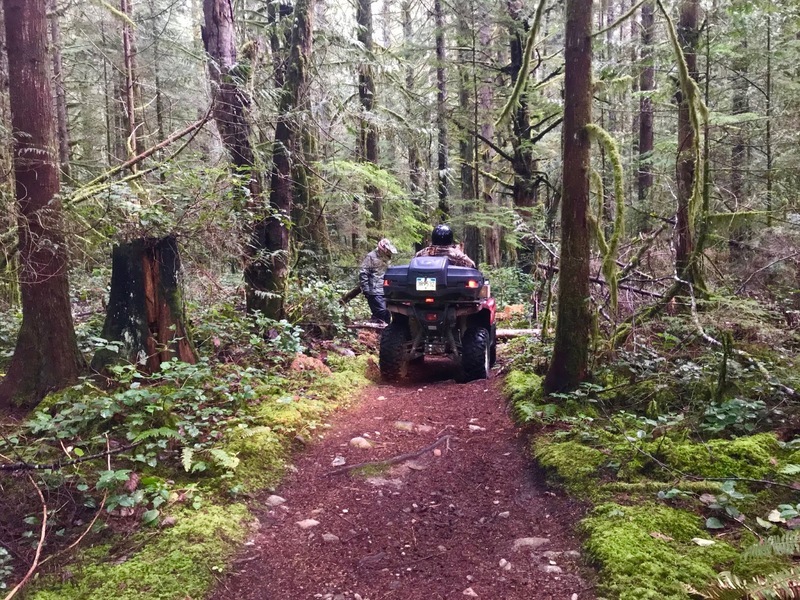 Logging roads in working forests are available for public recreation after 6:00 pm or on weekends and holidays. 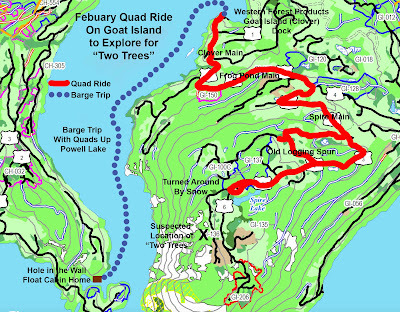 For more information about Goat Island check the Western Forest Products website or call their Road Access Hotline: 604-485-3132. It is available 24/7. Thanks for coming along on our winter quad ride. We had a very enjoyable day and learned a lot about our new camera. And later I also learned a lot about using the new version of iMovie to create my videos.